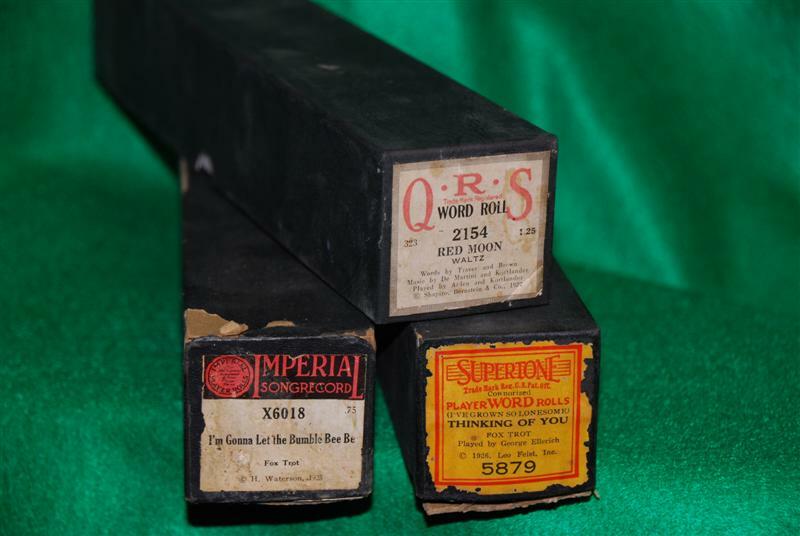 I have about 50 player piano rolls (exactly why I have 50 piano rolls is another story). Despite the fact that most of the rolls are about 80 to 90 years old they are in surprisingly good condition. However, I do not have a player piano to play the rolls on. In this part of the country (the Southwestern part of the US) player pianos are very rare so getting a player piano, much less having the room for a player piano, and investing the time and expense of repairing a 90 year old instrument, is not very likely. Today in an average living room the television is the centerpiece of the room, followed by an entertainment console that usually houses a DVD player, a bunch of DVDs, and maybe a gaming system. In the 1920’s when most of these rolls were manufactured, there of course wasn’t television, DVD players, or gaming systems, and commercial broadcast radio was still about 20 years away. Records were available, but records sounded tinny and were rather expensive. So what was “must have” the entertainment machine sitting in an average living room in the 1920’s? Most often it was a piano and most of those pianos were player pianos. 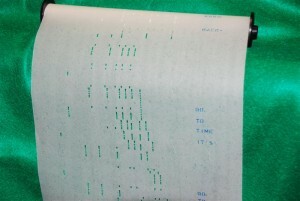 Back then, piano rolls were like CDs are today. All of the “Top 40” songs of the 1920’s were on pianos rolls. But just like listening to CDs, sooner or later you get tired of the music and want something new. 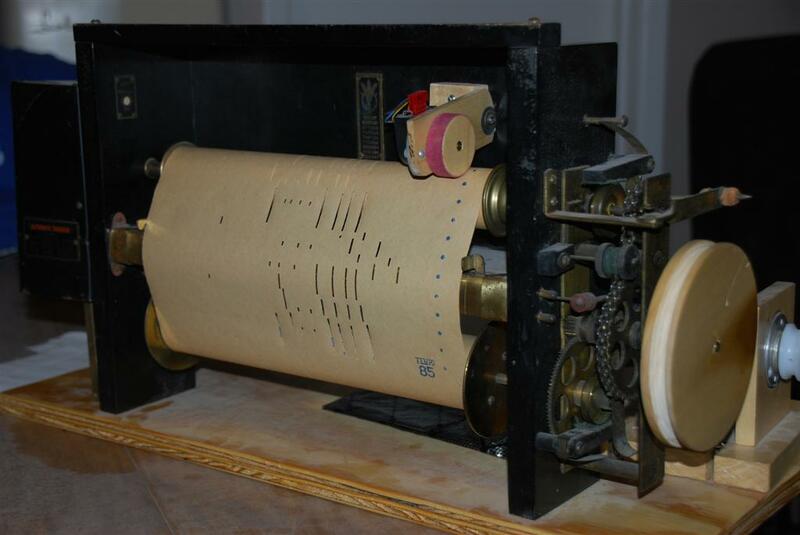 Back then people would go to Sears Roebuck and buy piano rolls. Families would often spend evenings together singing songs around the player piano. Yes, I know. It sounds incredibly lame by today’s standards, but back then they didn’t have much else as far as entertainment in the home. The player piano was pretty much the “in thing”. In looking over the rolls I found such interesting titles as “I’d rather forget than forgive”, “I’m gonna let the bumble bee be”, “Can I sleep in your barn tonight?” and a few with familiar titles like “I’m looking over a four leaf clover”. I began to wonder what music might be on the rolls – Just what did “Top 40” sound like in 1928? What secrets have these rolls kept hidden for the last 90 years? I decided to find out. On Ebay I purchased a player piano “spool box”. 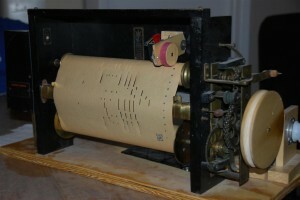 This is the mechanism that reads the rolls in a player piano. I wanted to find some way of converting the spool box into something that could extract the music on the roll and send that note information to a PC. Then on the PC that information data could be converted to MIDI. If all worked, I would be listening to music that few people have heard in nearly a century! Well life often has other plans and I put off the Player Piano Roll Reader Project for another day. It sat along with a number of other neglected projects for about 3 years until I discovered Quelab. In discussing the project with several Quelab members, there was renewed interest. These people wanted to hear what was on these rolls as much as I did and the idea of converting 90-year-old digital information to MIDI seemed pretty cool too. So the basic plan is this: Put a bunch of infrared LEDs on one side of the roll and 88 light sensors on the other side of the roll and read the data from the sensors. I chose infrared LEDs because paper is mostly opaque to IR while visible light pretty much goes straight through. Since the “read holes” in the spool box are too small for commonly available IR sensors, I will be using fiber optic cable to transmit the infrared signal from each hole in the roll to IR sensors on a separate circuit board. I used my cell phone camera to capture the IR output of the light bar. Although it is hard to see in the picture, all of the LEDs put out a strong IR signal. The next step is to order the fiber optic cable and start building the IR sensor board. This will be 88 IR light sensors connected to 88 fiber optic cables. I have been a hacker type dealing mostly in hardware and embedded processor stuff and some software for about 20 years. I am an Lead Engineering Technician by trade. Currently I work for a multinational corporate conglomerate government contractor - not as bad as it might sound - Really! I am fortunate to already have a personal hackerspace where I do most of my projects. I am interested in Quelab because I think it is a really cool concept and I would like to help Quelab grow and become something special. For Quelab I am available to give technical advise, to help with projects, or to get you pointed in the right direction get if you don't know where to start. If you see me at Quelab, stop and say "Hi!" and tell what you're working on. what i’m curious about is why you’ve completely failed to acknowledge that roll scanning has been openly taking place now for 3 decades, and your scanner’s design appears to borrow heavily from that of existing ones. As a member of mechanical music forums, you are completely aware of this. I am aware of the roll scanning projects that have been running for some time and that these have scanned and preserved hundreds if not thousands of rolls that might otherwise be lost to ravages of time. I am also aware of the roll repunching projects that have benefited from roll scanning. I did actually think about mentioning current roll scanning. The reason I didn’t say anything about the other roll scanning projects is because mechanical music is a very specialized hobby with a fairly limited audience. I am certainly not the first to come up with the idea of scanning rolls and you are correct roll scanning has been going on for about the last 30 years. Thanks for your comments. I hope to hear from you again.